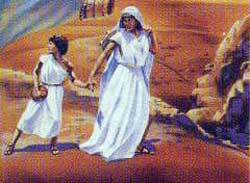 Hagar and her son, Ishmael. FTER THE DESTRUCTION of Sodom and the other cities of the plain, Abraham moved away from Hebron. He journeyed south and west, into the land of the Philistines, near the Great Sea, and made his home in a place called Gerar. Here he lived only a short when God gave to him and Sarah the child of promise. Abraham named the child Isaac (a word meaning, in his language, "laughing") because both he and Sarah had laughed when God told them that they should have a son in their old age. When the baby Isaac grew old enough to toddle about his tent-home, and to lisp words, his father Abraham made a great feast for him. Perhaps many friends were invited, and every one knew that Isaac's parents thought he was a very wonderful little boy indeed. Before the day passed, however, something happened which brought sadness to the kind heart of Abraham. You remember that Ishmael, the son of Hagar, Sarah's maid, also lived in Abraham's tent. These two boys, Ishmael and Isaac, may have played together sometimes, although Ishmael was much older than Abraham's little son. On this feast-day, when everybody else was happy, Ishmael was unkind to Isaac. Perhaps he felt jealous of the honor that Isaac was receiving from so many people. When Sarah heard how unkindly Ishmael had treated her little boy she became angry, and called Abraham. "You must send Ishmael and his mother away," she told him, "for I do not want our little boy to grow up with such a rude companion." Now, Abraham loved Ishmael too, and he felt sad to hear that the boy had mistreated his son. He thought that Ishmael might learn to be kind; but God told him to send the boy and his mother away, just as Sarah had said. So the next morning Abraham called Hagar and told her that she must take Ishmael and go away. He gave her food for the journey and placed upon her shoulder a bottle filled with water. This bottle was not made of glass, but of the skin of an animal; for people used skin-bottles in that long-ago time. Then Abraham bade them good-by, and perhaps he watched them as they started toward the land of Egypt, where Hagar used to live when she was a little girl. The road to Egypt led through the same desert where the angel spoke to Hagar when she had run away from Sarah's tent. On this second journey Hagar missed the road and wandered off into the trackless wilderness. She did not know which way to take; and after a while there was no more food in her basket nor water in the bottle which Abraham had given. And the hot sun beamed down upon the dry, burning sand all day, until Hagar and Ishmael grew so thirsty, faint, and weak that they could go no farther. Then Hagar laid her suffering boy beneath the shade of a little bush, and went away. "I can not bear to see him suffer and die," she said, and then she wept. But God had not forgotten about Hagar and her boy. Just as he had seen her on her first journey into the wilderness, so he could see her now as she sat weeping all alone. And soon she heard a voice calling to her out of heaven, "What is the cause of your sorrow, Hagar? Do not be afraid, for God has heard Ishmael's cry of pain, and he will save his life and make of him a great nation. Go, now, and lift him up." Then Hagar saw a spring of water which God caused to bubble out of the dry ground near by, and she quickly filled her empty bottle and gave Ishmael a drink. After this Hagar and Ishmael did not journey on to Egypt, but made their home in the wilderness, far from other people. God cared for them, and Ishmael grew to be a strong, wild man. He became a hunter, and used a bow and arrow. His children also grew up in the wilderness, and were wild and strong like their father. They finally were called Arabians, and even today their descendants live in the desert and wander about wherever they please, just as Ishmael, their forefather, did so long ago.